Revelations that North Korea has been secretly operating South Korea-invested factories in a joint industrial park shuttered in 2016 have angered South Korean officials, politicians and businesspeople. But there seems to be no practical way to stop the North’s “illegal use” of South Korean properties. On Friday, North Korea’s propaganda outlet Uriminzokkiri claimed that “it’s nobody’s business” what it does at Kaesong Industrial Complex, where its “sovereignty is exercised.” It also vowed to run the factories more actively and to show how its citizens are currently working “with confidence” there. The factory park, established as a symbol of inter-Korean economic cooperation in 2004, was closed in 2016 following a flare-up of tensions. The 124 South Korean firms, which had hired North Korean workers to produce clothes, shoes and watches there, had to leave everything behind after an abrupt eviction order. Radio Free Asia reported last week that the North has been running at last 19 textile factories there for months now. Seoul’s Unification Ministry denounced the North, saying it should refrain from infringing on the property rights of South Korean companies. However, it stopped short of mentioning countermeasures, saying it needs to first check relevant details. The South’s opposition parties strongly condemned the North and urged the Moon Jae-in administration to respond in a swift manner. “Kaesong industrial park, which was shut down in February 2016, must be operated under the joint consent of two Koreas and cannot be revived on the North’s decision alone,” Jeong Tae-ok, the floor spokesperson for the main opposition Liberty Korea Party, said in a statement released Saturday. Jeong added that North Korea has infringed South Korea’s property rights by resuming operation of the complex and expressed worries over the South Korean government’s capability to control the situation amid escalating tensions on the Korean Peninsula. “The current administration continues to say that it has yet to check on the matter. How will it respond to North Korea which seems to be (completely out of control)?” Jeong added. “It is a violation of the agreement for the normalization of Kaesong industrial park, which protects corporate assets and guarantees corporate activity at a global level,” said Lee on Saturday. The inter-Korean agreement for normalization of Kaesong industrial complex was signed by both Koreas in 2013 after Pyongyang removed 53,000 North Korean workers from the park, which led to a temporary shutdown. Clause 2 under the agreement guarantees protection of South Korean corporate assets and personnel within the complex regardless of the situation on the peninsula, which North Korea seemingly refused to uphold. Meanwhile, the South Korean operators behind the firms will hold a meeting on Wednesday to discuss Pyongyang’s decision to use their property. “North Korea cannot just resume operation (of the complex) without consulting with us and water and power supply was cut-off before the shutdown (in 2016),” said an unnamed Kaesong businessman Sunday. “They have seen us manage the complex for more than a decade, so it is possible they may know how to operate (simple machines),” he added, calling the North’s resumption of the complex as an unprecedented move. Suspicions over North Korea’s secretive operation of the complex have been mounting since its official shutdown in 2016, on the back of foreign media reports that suggested there were activities within the area. On top of the recent Radio Free Asia report, Voice of America on Aug. 21 said that about 100 South Korean vehicles in Kaesong had mysteriously disappeared in June. A secured satellite image showed the vehicles, which had been untouched as of the end of 2016, were gone, indicating North Korea had moved them elsewhere. 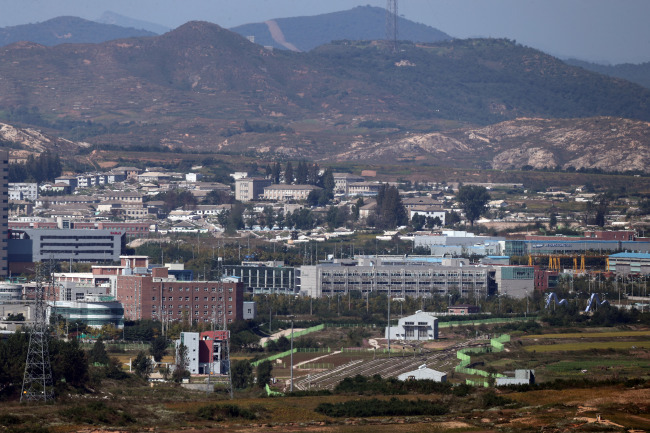 The joint industrial complex in the border city of Kaesong was shuttered in 2016, under suspicions that the revenue generated from the business was funding Pyongyang’s nuclear and missile program development.